Apple finally went through with it. 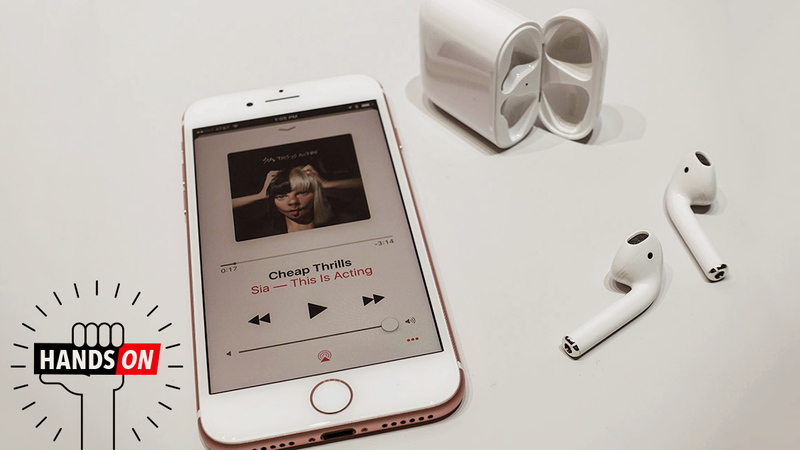 It killed the headphone jack on the iPhone 7. In its place, you can use headphones that connect to the Lightning port. But Apple thinks the future is wireless headphones. And AirPods are its vision for that future. AirPods are “truly wireless” earbuds in the way that I’ve been fantasizing about them for years. It’s a beautiful concept that nobody has been able to get right. I’ve tried many to various degrees of disappointment. So imagine my surprise on discovering after a brief demo that AirPods aren’t complete garbage. Visually, AirPods look like what would happen if you snapped a pair of EarPods off from their cable. If I’m honest, the design looks a little bit first-generation. It lacks polish that I’m used to seeing from Apple’s design team. I imagine we’ll see a more refined look evolve in the coming years. The AirPods have a special W1 wireless chip embedded inside. This chip (along with Apple’s software) helps them pair quickly with your phone, bypassing the pairing annoyances that plague Bluetooth setup these days. Simply open up the carrying case (which doubles as the headphone charger) and the Pods immediately pair with your phone. To the best of what I could ascertain, this is all still happening over Bluetooth. An Apple demo person told me that there was some “special sauce” that makes the Bluetooth pair process better, but the underlying technology isn’t anything new. This is cause for concern because though Bluetooth fidelity and reliability have improved in recent years, it’s still not the flawless technology most people desire. Still, the pairing process worked seamlessly, even though I was in a room with hundreds of press people and God only knows how many devices spitting out radio signals. As soon as I opened the carrying case by an iPhone, the AirPods would start the pairing process almost instantly. So easy. The slickness doesn’t stop at the pairing. In one smart feature, if you start music playback on your phone and you don’t have AirPods in your ear, music won’t start playing. In fact, it will only start playback when little sensors in the buds detect that they’re nestled in your ear canal. And if you remove an AirPod from your ear, music playback stops immediately. And of course, this is all one step closer to turning you into a drone with a computer in your head. Double tapping on the side of an AirPod fires up up Siri. From there, you can control playback, volume, or ask other questions using the microphones at the bottom of each AirPod. As for the sound quality, I couldn’t help but be impressed by how loud and full the sound from the AirPods was. Listening to a Sia track, the notes were crisp and the highs seemed really solid. The track I was listening to didn’t have a ton of bass, but on first inspection it seemed to be at least passable. In terms of feel, AirPods might as well be EarPods. My friend (and ear model) Dan said they seemed more comfortable to him, but I honestly couldn’t tell the difference. EarPods work in some ears and not in others. They fit fine enough in my ears, but if you’re the type of person who doesn’t like the feel of an EarPod, the AirPod probably isn’t for you. That may seem like I’m damning these things with faint praise, but I’m not. I’ve tried a number of different wireless earbuds over the last year and most of them feel like earplugs. Which is to say, they aren’t comfortable AT ALL. The worst thing you can say about AirPods is that they feel like EarPods, which is actually sort of a step in the right direction. While in my ears, the AirPods felt secure, which is important for expensive wireless earbuds. That said, I wouldn’t want to go running with these things. Battery life on the AirPods is promised at about five hours. That’s fairly standard for these types of wireless earphones. The included carrying case doubles as a battery pack (also common for these types of buds) and offers another 24 hours of reserve power you can use to juice your Pods back up. Apple claims that if you pop the AirPods in the case for just 15 minutes, you can get three hours of listening time. Although I don’t love the design of the AirPods, I do like how quickly they pair to your phone. And at $160, this is actually one of the few Apple products that doesn’t seem supremely overpriced. I’d need more time to get a sense of the actual audio quality, but my first impression wasn’t bad. We’ll let you know more when the AirPods are available in late October. Apple’s New iPhone Doesn’t Have A Headphone Jack, What Does That Mean For Your Car?